A rich, mysterious, cantankerous uncle. A hint about cards. Was I the only reader who, forgetting the blurb on Amazon, briefly thought I was about to read a book about a magician (stage or otherwise)? 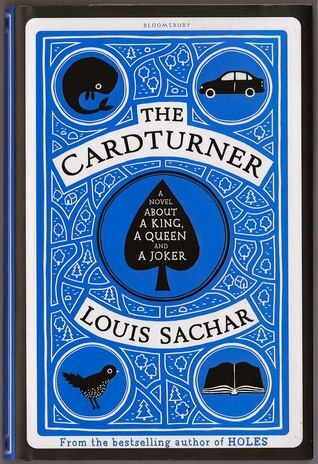 But nope, The Cardturner is a book about the card game Bridge. It also has a story - a very neat and nice story about a teenager and the uncle he is meant to endear himself to for the inheritance. But primarily, this is a book trying to get young people interested in playing Bridge. Well, I thought a lot of the Bridge stuff went way above my head. It's a bit like the latter chapters of Cory Doctorow's Little Brother in that regard: you sort of feel you've been learning and understanding a lot, some of it quite complicated to envision in your head, and then it just breaks through the threshold of "I can follow this" and into the territory of "I'm a bit lost, but carried along by the story". There are various questions that formed in my mind (how much dialogue can there really be, in the bidding process - it only goes through two or three iterations in all the examples in this novel, so hardly enough to make meaningful communication possible! And how can it be rewarding to play a turn based strategic battle game that can only last through 13 turns? Etc.) - but there is enough excitement in the story, and a sense of the panache involved in some of the Bridge manoeuvres, that I really enjoyed the novel. But it's a beautiful novel, nonetheless. It's for young people, but I loved reading it, even if I felt that the story was a little too neat and cute for its own good. (That said, there were some jolts that I felt quite acutely as a reader, moments when the story had big impact in not entirely the expected way). One flaw were the asides to the reader - each time the author writes something like "if I were a better writer, I'd have..." or otherwise acknowledges the writer / reader interface, I feel a little annoyed. Still, I'd recommend this book. It's a cracking read.